← We’ve Given Baking for Good a Makeover! I promised you pumpkin risotto, and now here it is. I was inspired to make this dish after seeing this post from the drool-worthy Spoon Fork Bacon blog. I decided to make it with mushrooms because my guests couldn’t have shellfish, and I simplified the recipe a bit to save space on my countertop and stove. I hope you enjoy it, and I promise (maybe) that this will be my last pumpkin post of the season. 1. First, make the pumpkin sauce: Stir together the first six ingredients in a small pot and bring to a simmer over low heat. Simmer for about 3 minutes, then stir in 1/4 cup of the broth and 4 Tablespoons of the butter until the butter melts completely. Remove from the heat and season with salt and pepper. Set aside until ready to use. 2. Pour the remaining chicken broth into a medium saucepan and let it warm over low heat. 6. Place a large pan or dutch oven over medium heat and melt the remaining 2 Tablespoons of butter and 2 Tablespoons of olive oil. 7. Add the onion and garlic and sauté for about 3 minutes. 8. Add the rice and stir for 3 to 5 minute or until each grain of rice is coated in oil and the sides of the grains have become translucent, leaving a white dot in the center. 9. Begin adding the warm broth to the rice, one ladle-full at a time, stirring constantly. 10. Each time the liquid is absorbed, add another ladle of broth and continue to stir. 11. Continue to add the warm broth and stir until the rice is al dente, 20-25 minutes. 12. Stir in the pumpkin puree until completely combined. 13. Stir in the mascarpone and parmesan until smooth. Season with salt and pepper. 14. For the mushrooms: place 1 Tablespoon of olive oil in a skillet over medium-high heat. Add the mushrooms and saute until tender, 3-5 minutes. Season with salt and pepper. 15. 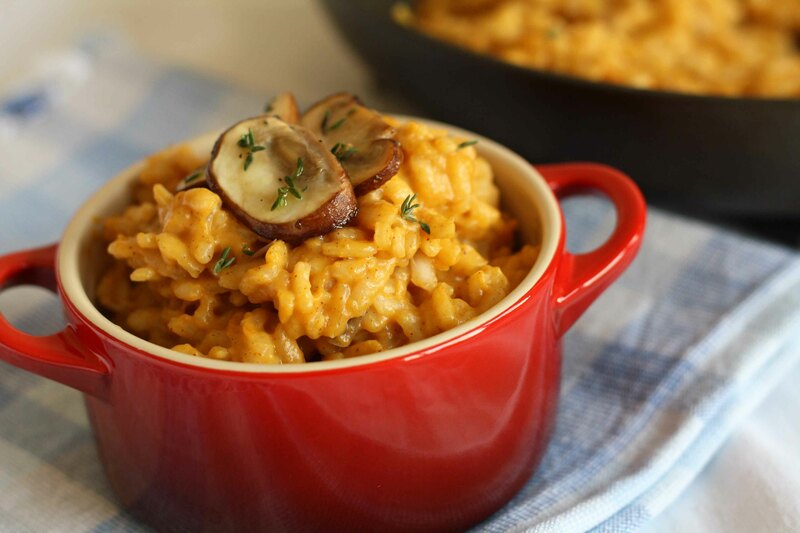 Serve the risotto immediately, garnishing each serving with several slices of mushrooms. Enjoy! P.S. If you haven’t already, stop by Baking for Good to see our newly redesigned website! made this today, was super yummie!